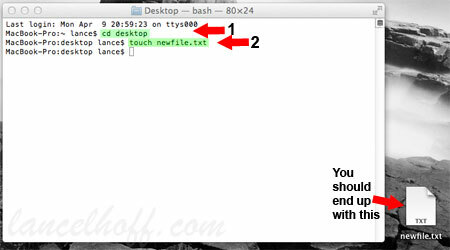 (1) Click the Magnifying Glass in the upper right hand corner of your Mac OS X Desktop, (2) Type Terminal into the Spotlight, (3) Select Terminal from the list. Additional Notes: Using cd, you can change to any directory (doesn’t have to be desktop). You can use touch to create a new file named whatever you want (doesn’t have to be named newfile,txt).